Ryokan – hotel in traditional Japanese style, which throughout Japan about 58 000. Most of the focus in the areas of hot springs. Ryokan – it’s more than just a place to sleep. Here you will have the unique opportunity to join the ancient oriental culture: rest in bed of futon to sleep on this mat, take the traditional Japanese bath and rasprobovat local cuisine. 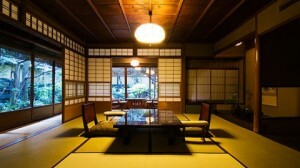 Ryokan differ from each other in terms of price, style and the available space. There is a modest family hotel with a small number of rooms, and large resorts on the likeness of the western hotels. 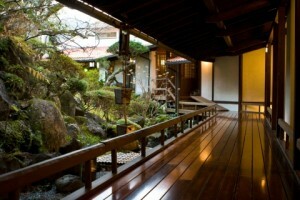 Traditional ryokan occupy the old wooden building, the convenience they are often located on the floor. More modern hotel outside seem unremarkable, but inside, faceless concrete walls, hides a unique Japanese atmosphere.The price range is very wide, although the average night in a Japanese hotel costs between 12 000 to 20 000 yen per person. On arrival in the ryokan, all guests must remove their shoes before entering the hotel (as well as before any other Japanese home). Shoes are left in one of the special lockers on the ground floor – it is available you do not need. Some ryokan can wear slippers, but you can walk in them only on the wooden floor. The traditional Japanese rooms are all pretty simple and without frills: a room lined with tatami, from the furniture usually have only a table (and seat cushions zabuton), sometimes a couple of chairs, a little more decorative elements. Sleeping in these rooms made on the tatami, Japanese futon mattress, which you rasstelet bedtime maid (day futons stored in the closet). If the two rooms or more, they will share the traditional sliding doors. In modern ryokan, along with Japanese rooms have a number of European bathrooms – with an ordinary bed, without the mat. Most ryokan provides for its guests home yukata – cotton robes white and blue, which can be used as pajamas, and Yukata for exploring the surroundings. 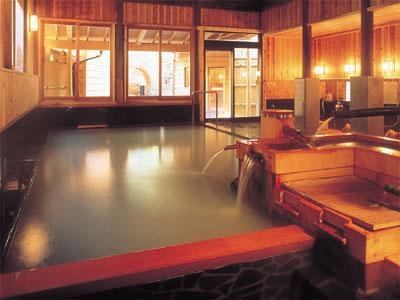 The Ryokan has public baths ofuro, for which the Japanese and come to the hotel. Some ryokan include onseny – spas with hot springs. 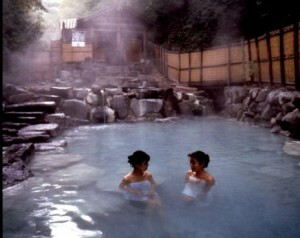 Usually part of the baths in the onsen is located in a room, and some in the open air – they are called rotemburo. Baths separate – for, but there are also common men and women. The Japanese love hot springs and baths in the ryokan – the best way to relieve the stress you can imagine. Visit Japanese baths made bare, the only thing that we can take this towel. Swimwear is prohibited in most places. All personal belongings you leave in your personal mailbox with the key. Just before visiting the baths all visitors need to take a shower (before you get into the bathroom, make sure that the soap is left on the body). The water in the bath enough hot (40-44 ° C), but even when you get used to the heat, remember that you can not swim for a long time: be sure to take breaks, so the body is not overworked. Often ryokan have separate, private bath – usually they are ordered families, couples and groups of friends. As a rule, private baths public inferior in size and require further booking and payment. But it is an ideal option for those who want more privacy. 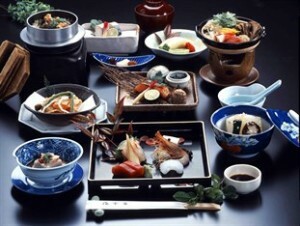 The rate usually includes breakfast and dinner: the better the ryokan, the more refined and delicious food can be. Some hotels serves kaiseki ( “haute cuisine”) – a traditional Japanese dinner with the change of dishes. Breakfast in a traditional ryokan Western visitors are likely to be disappointed – from the dishes served here are only rice, seaweed, miso soup, and raw fish. But in many modern ryokan, along with the Japanese breakfast is served Europe, consisting of eggs and sausages. After a relaxing bath, visitors can stroll through the gardens of the hotel or go to the city. Often on the streets of cities such as the Kusatsu, Dogo, Shibu, Kinosaki Miyajima and you can see how guests local progulivatyutsya oldest ryokan in yukata and geta (wooden shoes on the platform), looking for the way to the shops with traditional souvenirs and a cafe. 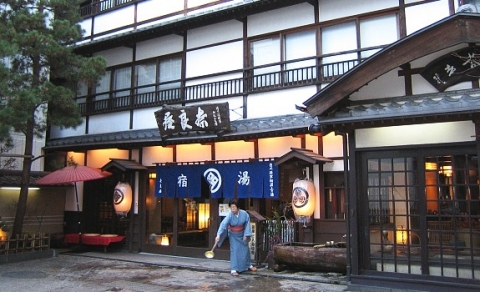 Some modern ryokan also offer their guests additional entertainment -karaoke, restaurants, bars, games rooms and shops – some of which are open all night.